You need a valid 25-character product key to be able to download the ISO for Win7 or 8.1. Another really dumb decision reversed. woody 1 month, 1 week ago. You need a valid 25-character product key to be able to download the ISO for Win7 or 8.1. Paul Thurrott on Thurrott.com. Hmmmm this is news for Paul? They have been available all along. Win8.1 doesnt need a key for download, but its the revision3 complete with all the big updates kb3000850 etc but still needs approx. 2.1GB to get up to date and has the irremovable Snoop KB2976978 bundled with it alas. I’m also a bit surprised this is news. I bought my Windows 8 copy exactly on the 15th of February 2017 and haven’t even touched the CD disks bundled in the box. Went straight to MS site to download 8.1 ISO to save the hassle of updating Windows 8 to Windows 8.1. Not sure why this is news, the downloads have been there for many months, and you still need a retail key to download a win7 iso. I didn’t realize that the downloads were there! I’ve always recommended using HeiDoc.net. No code is necessary when you download via Heidoc.net. You can download every currently-supported version of Windows and Office there. Thanks, Woody, for putting this information somewhere where I could find it. Hello: I downloaded the ISO 64 bit version of Windows 8 .1. It downloaded to a DVD drive G (thats what is listed on the computer window) of which I did not have a dvd in the dvd drive. I wanted to download it to a usb flash drive, but, it didn’t give me a choice about the download. Do I actually have the windows 8.1 ISO on my computer? I’m thinking I should delete it until I get more info. Though, Microsoft stated Links expire: 12/5/2018 11:35:47 PM UTC. The only reason I wanted the Win 8.1 ISO is because i cannot back up my operating system because of a disk error, of which, I have tried several chkdsk locate and repair command prompts which have not worked. Each time I try to backup, I get the “error 1117 disk error. The ISO could not have downloaded to a DVD drive if you had no DVD in the drive. It must have downloaded to a different location on your computer. Look in your “downloads” folder and see it it’s there. If it is, you can burn it to a DVD or a flash drive at any time. PKCano: Thank you for answering me. I just realized when I looked at the ISO download, it is under the Windows (C:) Computer section as “DVD Drive (G:) IR5_CC5A_X64FRE_EI”. I cannot find a way to download to my flash drive. boot, efi, sources, support, autorun.inf, boot mgr, boot mgr.efi, and setup.exe. Each one of these are on a separate line. I am afraid to click on any of them. When you clicked on the ISO it mounted as a DVD drive. If you click on the setup.exe it will start the installation. You do not want to do that. Right click on “DVD Drive (G:)” and in the pulldown menu click on “unmount” or “eject” – that should dismount the ISO. Then you need to find a file on the computer that ends in .ISO – that is what downloaded. Look in the “Downloads” folder or wherever your downloads go. You didnt say what software you are using to backup or the type of backup. Some software can be told to ignore read errors. You can expect to find an option like this in a disk image backup program. That way you get the 99.9% of the your files/sectors backed up. I have two copies of Win 7 HP Boxes CD’s and Keys and they both verify but guess what? So I guess I need an interpreter to reinstall Windows 7 from now on! This link will only allow me to download Win7 in French or Korean, not the US-English I need. I get the same response for French or Korean. Mine is a Windows 7 pro upgrade bought from Digital River. Strange. I wonder why it interprets your keys as being for version “K”? Any guess? If you can track it down, this would make one interesting Computerworld article. Both of my keys are upgrades (boxed retail packages) if that helps. Just checked the Windows 7 download link myself and was also offered the Korean language version only. 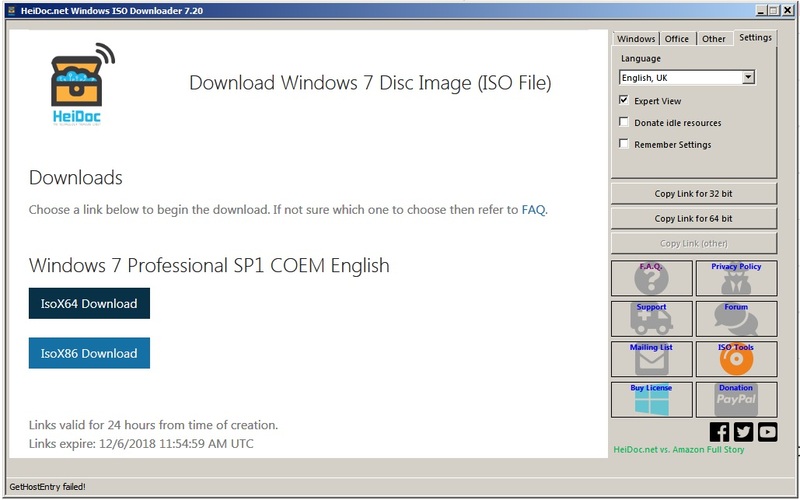 Fortunately, the HeiDoc download tool is still offering the Windows 7 ISO in multiple languages including English, with no product key required. HeiDoc FTW, works really well! Never used digital river nor am I likely to or any others with the exception of direct links to MS tbh. I wouldn’t be surprised if MS has their wires crossed somewhere behind this public-facing download page. In any case, these ISO files have been available for a long time including COEM versions – without providing a valid key. Getting these links has been difficult since Digital River’s were pulled long ago. HeiDoc has a great utility that still provides the direct MS links. Pick the version and language you need. (When running it, one can decline the request to share your idle computer time in support of HeiDoc (!) and refuse to modify any entries in your host file if it asks. Sheesh….) The links are real and the ISO files are genuine. If you are paranoid, a completely independent utility (Windows and Office Genuine ISO Verifier) can be used to verify the SHA-1 against known valid SHA signatures. Of course, you will still need a valid key that matches the version you are reinstalling in order to activate – as it should be. You can’t use OEM keys to download Windows 7, it tells you to contact your system manufacturer. To obtain a bloated restore disc I’m sure! You can’t use OEM keys to download Windows 7, it tells you to contact your system manufacturer. I have downloaded Windows 7 and 10 from heidoc.net. And the OEM key worked to activate it; but I had to do a phone activation, the online activation didn’t work. I had success with several Windows 7 OEM computers this way. The online activation hasn’t worked for years leaving telephone activation. Note: The description in the link isn’t correct as this DOES work on windows 7 x64 and x86! I’d advise anyone wishing to use Windows 7 beyond EOL to use this but, in saying that, I don’t recommend using Windows 7 beyond EOL Online. If the oem requisites are present, then win7 installs are immediately activated, no internet or telephone needed. Then you get to suffer through all of those os updates. A key is not needed to download win10 or win8.1 isos from microsoft’s software download page, only for win7. Not a fan of this method at all. Volunteering to disclose a valid Product Key over the interweb could also have other implications, time will tell when Win7 EOL hits, or if we are unlucky, earlier. How “updated” are these ISOs of Win 7 Pro 64-bit (from each of (a) the MS link per Therott’s article and (b) https://www.heidoc.net/joomla/technology-science/microsoft/67-microsoft-windows-iso-download-tool)? If I were actually to install one, would it then need to find and run ten years of MS updates? I might have the “OEM” problem – my Win 7 Pro 64-bit key might be OEM and not independent and therefore the MS link might not cooperate. But all I want is the ISO as a reference or fallback. Can I get the ISO with someone elase’s key even if I would never use that key to install and activate? Can I get the ISO from https://www.heidoc.net/joomla/technology-science/microsoft/67-microsoft-windows-iso-download-tool without a key? 1. The ISOs you’d get would be the same from either. They both point to Microsft servers. I believe they would be only as current as when they were originally released – as if you still had a CD from when you frst installed. 2. Updates would be needed. For Win 7 be sure to grab the SP1 version. 3. Just use the HeiDoc utility and select the COEM version you need (32 or 64 bit). No key required to download. Download several different ISOs – retail and OEM to cover your bases. 4. No key required to download – only when actvating. I downloaded Windows 7 Pro 64-bit using the heidoc.net tool. It included service pack 1. But other than that, there were a whole lot of Windows 7 updates that it did not include. I downloaded and installed all “important” updates, and the number was in the hundreds. You don’t need a key of any kind to download via heidoc.net. However, you will need a key to activate Windows after you download and install it. You see,I got an 8.1 installation .iso file from MS, about a year ago. Now, if I were to install it, it will probably mean I’ll have to download and install scads of patches to bring 8.1 up to date. I just cannot see myself doing that: not patient enough with that sort of thing. I expect that when I finally get Mint installed on my PC instead of the now terminally failing Windows 7, at least I won’t have to do that. Hmmm… Would I? In any case, no need for keys… is there? Hmmm… No? Really? No need to call some guy on the telephone? Then at least there is that. Now, if I were to install it, it will probably mean I’ll have to download and install scads of patches to bring 8.1 up to date. Well, install Win8.1 on 2/25/2019 and I had 165 Important Updates (Includes Recommended), and 7 Optional. I downloaded the windows 7 ISO’s from Digital River many years ago, while I had the chance. This were before Microsoft pulled them. So I should have a clean windows 7 ISO, without all that telemetry, spying and without the messed up, roll-up updates we now have. Unless you can find a website you trust to download windows ISO’s, then you really are best to buy, a used or old stock version of windows 7 DVD from site sites like ebay. I would advise against anyone putting there window key code, into sites just to download a ISO of windows. Likely activation issues if you do or your working key sold on illegally. There is no reason to stop using the last and one of the best versions, of window, after MS have ended support, even on line. I think windows 7 will be supported for a long time as most hate windows 10, like I do. Hopefully askwoody and other windows 7 fans can campaign, to get Microsoft to carry on supporting windrows 7 security updates, fixes for another few years yet. You can bet that’ll be a major topic of discussion in 2019. We’ll push. Hard. Remains to be seen if we can budge MS — but there will always be alternatives. Error 1117 I/O Error is a Macrium Reflect error message. The upshot is that either the disk has issues, or perhaps that you have a SATA data cable issue. Please run Piriform’s Speccy. After Speccy’s main window has updated (all info is filled in), click on the blue Storage link, and then post a screen capture of what is shown for the particular hard drive. Attached is an example Speccy screen capture for one of my computer’s hard drives. You might have to capture two screen shots in order to show all of the Speccy information about your hard drive (both the rows of information, and the SMART data table as well). Your posted screen captures will allow us to determine if your hard drive has an issue, or if your hard drive’s data cable connections are at issue. Please create a Topic in the proper Forum to continue helping the poster. I can’t figure out how to start this in a new forum or topic. EDIT: This discussions continues in this topic. The discussion continues in a new topic. Did you by chance download any of the the original Win7, Win8, or Win8x RTM ISOs? Some people here might need them if they have really old brand name manufactured computers. The only RTM ISO which I downloaded from Digital River was the Win7 Pro x64 RTM ISO X15-65805. I didn’t realize that the downloads were there! I’ve always recommended using HeiDoc.net. 1. First, Heidoc.net performs the download by installing a downloader tool. You probably do NOT want this downloader tool installed on your computer since you have no idea what this downloader tool actually does! 2. Second, the Windows ISO Downloader.exe! (which is available from other online sources), installs digital coin mining software on your computer! I JUST GOT INFECTED WITH THIS DIGITAL COIN MINING SOFTWARE. NEITHER PANDA, MALWAREBYTES, NOR HITMAN PRO DETECTS IT. ONLY GMER DETECTS IT AS NUMEROUS UNKNOWN RUNNING THREADS (SEE MY SCREEN CAPTURE AND NOTE THE NUMBER OF RUNNING YET UNIDENTIFIABLE THREADS). THIS IS VERY SIMILAR TO THE NUMBER OF UNKNOWN RUNNING THREADS WHICH I SAW AFTER I WAS INFECTED BY THE MALWARE LADEN CCLEANER VERSION 5.33. SYSTEM RESTORE DID NOT WORK IN THE LATTER CASE. I HAD TO PERFORM AN OFFLINE RESTORE OF MY OS PARTITION IN ORDER TO ERADICATE THE MALWARE IN CCLEANER VERSION 5.33. NOTE THAT GMER ON MY COMPUTERS NEVER REPORTS ANY UNKNOWN THREADS, OTHER THAN JUST ONE THING: THE UEFI BOOT RECORD AS BEING AN UNKNOWN BOOT RECORD. I am kicking myself for so stupidly deciding to test this program. So now I have to pray that a System Restore will eradicate this Windows ISO Downloader.exe digital coin mining malware. If not, then I have all day ahead of me in terms of performing an older offline OS restore and then getting everything up to date. Oh, and by the way, the Windows ISO Downloader.exe file passes with flying colors in VirusTotal. This is because its nasty stuff is actually embedded within a 3.57MB TEXT file. I can think of ANOTHER program which was recently talked about on this forum, for which I told Woody to delete all of my posts with regards to this other program. To Satrow, when I say something, it is because I know what I am talking about. GTP — Thanks for your oblique reference above to your experience with another program recently discussed on this forum, for which your forum quotes were deleted. I never installed it; I deleted the installer and related files from my HDD and backups; and I’ve never looked back. Thanks again; and for all else that you do on this forum. Well, a reboot and Safe Mode System Restore from this last Saturday night did not work. Thus, this malware is persistent across restore points, just like the CCleaner version 5.33 malware was. GMER still shows that malware in the form of dozens of unknown threads were still running. This was not the case as of last Saturday night and just before I performed a differential Macrium backup. Presently I am performing an OS partition restore of the offline Macrium backup image which I created this last Saturday night. This restore will take another two hours or so to complete. I will report back to verify that GMER is no longer showing a plethora of unknown running threads after the restore completes. This message was typed using my backup laptop computer. Please create a topic in the appropriate Forum to continue this discussion. It is off-topic in this thread since the source was different software. I am kicking myself for so stupidly deciding to test this program. No, perhaps you should be kicking yourself for not reading the information on screen when testing new software instead. Read it and click No. My experience is the same. Since I never trust anyone to ‘share my resources’, I clicked NO and the program proceeded to work without issue. Out of concern, I also investigated processes, threads, dlls and the registry using the info from Automated Malware Analysis – Joe Sandbox Cloud and also ran GMER. All clean…. I wish HeiDoc hadn’t done this but at least they’re up front with it. One can completely bypass the downloader function of the program by clicking a button to copy the URL then paste it in your browser and download direct from Microsoft. @satrow that’s intriguing, the last time I went over to Heidoc or Jan Krohn’s site I got that message and instinctively clicked “NO” rather than read it. Just curious as to what it meant “we will buy more product keys to improve link generation”. I was always under the impression it either modified the HTML for the Official links page as to unlock the availability of the other versions, or it was linked in to the old M$ Tech Bench Web page. same as on GitHub. I have no doubt they are all official M$ Sources genuinely “untouched” having downloaded 1 or 2 over the years. Sure a lot quicker than the, for instance, Win7 M$ download page where it took about 10-15 minutes to authenticate the key for the correct version in EN, you can almost be done downloading through Heidoc by the time M$ says your good to go. I poked around on Heidoc’s forum pages. It appears they use a database of valid product keys to get the links at MS to unlock. They get used keys from people for a few bucks and since they’re already ‘activated’, they can’t be used again – but they work fine to unlock the ISO downloads. Aha. So THAT’S how they can provide all of these downloads. sorry that happened to you, GTP. Do you really think that I would be so stupid as to not read the info in that popup message? Uh, no, I did read it. And then I IMMEDIATELY CLICKED ON THE “No” button. Yet then I stupidly and actually allowed the subsequently displayed program to run for a couple of minutes (yet with no interaction), instead of then killing the subsequently displayed running program. You also checked the Settings tab before running it? There’s a URL link per ISO on those I selected, no need to use the software to download. What files/folders were installed? What detection classifications do you see? Have you checked your MBR? You’re sure it wasn’t installed via some malvertising etc. in your browser? What active AV and AM do you run? Why are you not complaining on their software forum? I believe I’ll avoid Heidoc.net given the information here. I had Win ISO Downloader open for 2+ hours yesterday, traffic was minimal, GMER found nothing, neither did my firewall or Process Explorer, GPU activity was normal too – no indication of anything out of the very ordinary. Same results here, no problems. I know some of you are aware of programs that will give you your product key, but not all of them work on Windows 7 and up. This one works on all including Windows 10. DO NOT DOWNLOAD the Windows ISO Downloader.exe!!! HERE IS WHY: 1. First, Heidoc.net performs the download by installing a downloader tool. You probably do NOT want this downloader tool installed on your computer since you have no idea what this downloader tool actually does! That’s incorrect. The tool leverages the download tool that’s integrated in MSIE, which is preinstalled on every Windows system. 2. Second, the Windows ISO Downloader.exe! (which is available from other online sources), installs digital coin mining software on your computer! That’s a lie that has been spread in other places before. Hackers did crack and rebrand the tool under names like “Microsoft ISO Downloader Pro” and do provide it for download in various locations. I don’t know if these fake tools include mining components or not. So I paid hundreds of dollars for a code signing certificate, so that the genuine ISO downloader can be easily distinguished from all the fake ones. But frankly, if you download that hacked stuff, and then blame me for getting infected, that’s like accepting Disney Dollars for a sale, and then blaming the Federal Reserve Bank for not having received real cash. False. It passes VirusTotal because it contains no malware. Do you really think all the experts with all the major anti virus software providers, to all of which VirusTotal connects to reach a verdict, don’t know how to do their job and detect an alleged malware component in a file that’s been downloaded 20 million times??? YOU do obviously NOT know what you’re talking about, and blame others and write defamatory posts because YOU have not been careful, got your computer somehow infected, and don’t accept that that’s exclusively YOUR own responsibility. The ISO downloader is a tool that I made to help people, and not to harm them, nor as a cash cow, although it needs to be sustainable and the operating cost be covered. As I read this thread, @gonetoplaid reported his experience… and he, in his own words, did not download the clean version, from your site. Fortunately, the HeiDoc download tool is still offering the Windows 7 ISO in multiple languages including English, with no product key required. HeiDoc has a great utility that still provides the direct MS links. Pick the version and language you need. (When running it, one can decline the request to share your idle computer time in support of HeiDoc (!) and refuse to modify any entries in your host file if it asks. Sheesh….) The links are real and the ISO files are genuine. All of these are recommendations, or show that there is no malware found when downloaded from HeiDoc.net. Its good to have your rebuttal, as well, for it summarizes what others in this thread had already said, just in case it wasn’t clear. It can be difficult to have a good and helpful product criticized, but only one person, who did not download from Heidoc.com, had a negative experience. I’m a non-techy type, but have used Windows 7 and 8.1 ISOs downloaded with Windows ISO Downloader, from the HeiDoc.net site, to do clean installs for myself, family, and friends, over a period of years, with no malware ever having been installed (and I went there because of recommendations on this site). Thank you for your helpful resource… and for addressing the concerns of the one person who did have a bad experience. Hopefully you are receiving enough donations or monetization to allow this really valuable resource to continue to exist. It was about 10% of the current size, until I was forced to blow it up like that as new laws became effective (GDPR). at https://heidoc.net/joomla/about-us/63-privacy-policy has a section 16 about Windows ISO Downloader, but it doesn’t mention anything about using my computer’s idle resources or any other monetization methods (except video advertising). Yes, I saw most of these recommendations, and should have noted them in my post. My bad. Thanks for pointing them out, and collecting them all in one place. It can be difficult to have a good and helpful product criticized, but only one person, who did not download from Heidoc.com, had a negative experience. Sadly, it’s more than one person. It’s only one person here on this forum, but I’ve seen it many times. Someone who searches Google for questions like “does HeiDoc mine bitcoin” inevitably find threads like this one, find their opinion confirmed, and that’s how rumours spread. You’re very welcome. It’s not in danger of being shut down at all. Glad to hear it’s all going well!